Novak Djokovic and Simona Halep reach the second round in Melbourne. 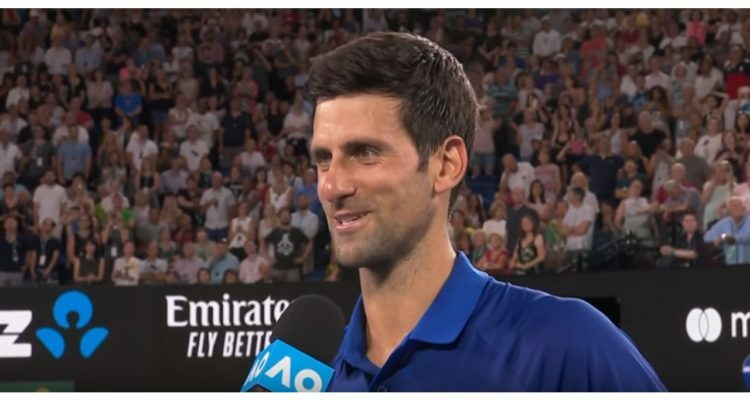 Six-time Australian Open champion Novak Djokovic opened his Melbourne campaign on Tuesday when he took on US-American qualifier Mitchell Krueger in the night match on Rod Laver Arena. Djokovic, who won all 17 of his previous meetings with qualifiers at the Grand Slams, remained untroubled securing a 6-3, 6-2, 6-2 victory in two hours and three minutes. The World No. 1 hit 40 winners and capitalized on six of his 20 break point chances. “It was a very competitive match and I had to work hard. I enjoyed it, hope you did too,” said Djokovic, who will next face French wild card entry Jo-Wilfried Tsonga. A seventh crown down under would see the 31-year-old Serbian claim his 15th Grand Slam title and move ahead of Pete Sampras on the all-time list for most Grand Slam men’s singles titles. Earlier in the afternoon on Rod Laver Arena, No. 4 seed Alexander Zverev began his quest for a maiden Grand Slam title when he beat Aljaz Bedene of Slovenia 6-4, 6-1, 6-4 in one hour and 55 minutes. At 21 years 282 days, Zverev is looking to become the youngest Australian Open men’s singles champion since Djokovic won the title here in 2008 aged 20 years 250 days. The German youngster, however, must improve on his third round finishes in 2017 and 2018 if he is to do so. It will be one of the most interesting bets in Australian Open. The 21-year-old German also answered doubts about his fitness. Zverev will next face Jeremy Chardy, who emerged victorious from the all-French-affair with Ugo Humbert 3-6, 7-6(6), 6-4, 6-4(4), 7-6(6). On Melbourne Arena, Milos Raonic knocked off Australia’s home hope Nick Kyrgios 6-4, 7-6(5), 6-4 to set a second-round meeting with 2014 champion Stan Wawrinka. Simona Halep, the top seed of the women’s draw, had to work hard for her first round win against Estonia’s veteran Kaia Kanepi. The World No.1 from Romania rallied from a set down to prevail 6-7(2), 6-4, 6-2 in two hours and 11 minutes. “I know that she’s hitting the ball very strong, is going to take time to get the lead in the match. I didn’t give up, which was really important tonight,” Halep said. Elsewhere, Daria Kasatkina became the first top-10 women’s seed to fall as she was thrashed 6-3 6-0 by Timea Bacsinszky from Switzerland in only 55 minutes. No. 4 seeded Japanese Naomi Osaka began her campaign in confident fashion with a 6-4, 6-2 victory over Magda Linette. Sixth seed Elina Svitolina made it safely through with a 6-1 6-2 victory over Viktorija Golubic. Laura Siegemund of Germany sealed a fine comeback victory against two-time Australian Open champion Victoria Azarenka, winning 6-7(5), 6-4, 6-2 in two hours and 42 minutes. This entry was posted in Australian Open, Grand Slam and tagged Australian Open, Grand Slam, Novak Djokovic.